Consumer spending thawed a bit in February, lifting retail sales for the first time in three months. A long, cold winter has kept shoppers at home over the past few months, particularly in the Northeast and Southeast. Some of the pent-up demand for retail goods was released in February, though revisions to the prior two months cut deeper than anticipated. 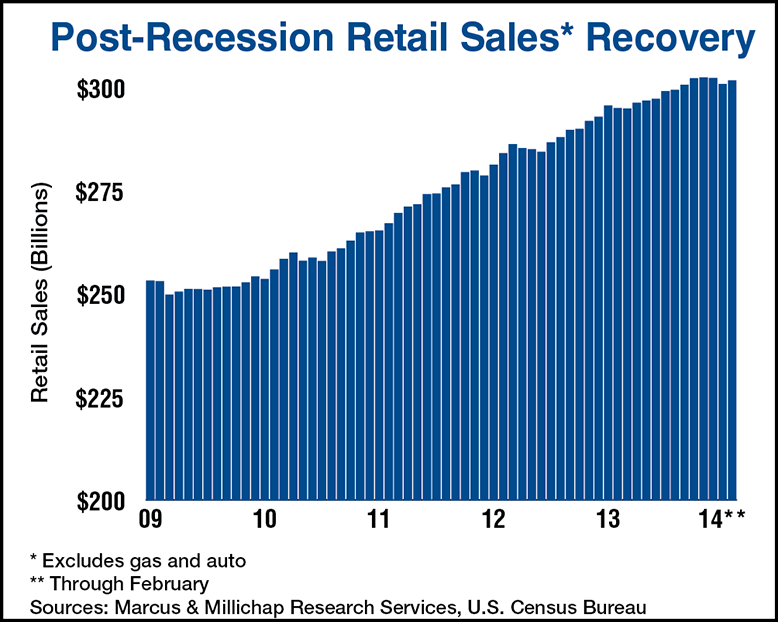 As the weather improves and the job market maintains a steady growth trajectory, retail sales should gain solid footing. March, however, could prove to be another challenging month for year-over-year comparisons as Easter retail sales will shift to April this year. Nonetheless, most indicators point toward economic improvement as 2014 progresses, which will boost spending, albeit at a more modest pace than during the initial stages of the recovery. Retail sales inched up 0.3 percent during February, which is an encouraging sign after declines in the prior two months. Most of the gains recorded last month were payback from cuts in January, with broad-based gains in eight of the 11 components. The largest advances favored sporting goods and hobby stores, and non-store retailers including the Internet, which climbed 2.5 percent and 1.2 percent, respectively. Food and beverage, general merchandisers, and electronics and appliance stores recorded the only losses last month. All three segments recorded only modest declines and only general merchandisers are in the midst of an ongoing trend toward tightening. Several important economic indicators support retail sales growth going forward, though some headwinds are looming on the horizon as well. Employment growth in February was above expectations as more people entered the job market. Initial jobless claims are also lower, lending credence to a stronger economy. Two major unknowns could dampen consumer spending in the coming months and need to be monitored closely. Mandatory health insurance will pull more than $1 billion out of the economy per month by April, and that number will rise as penalties stiffen over the coming year. Rising interest rates are also a concern as revolving debt becomes more expensive and thousands of homeowners enrolled in the Home Affordable Modification Program face higher monthly mortgage costs. Retail operations will continue to improve this year, though new entrants into the “bricks-and-mortar” arena will need to emerge to overcome store closings. Staples will close more than 200 stores, while Radio Shack shutters more than 1,000 units, bringing millions of square feet of dark space onto the market. Nonetheless, demand from healthy retailers will drag down vacancy 70 basis points to 6.5 percent while asking rents progress 2.5 percent to $16.77 per square foot. The industrial sector is highly dependent on retail spending, particularly sales at non-store retailers such as Amazon. Even traditional stores are elevating their presence in the digital arena, including Sears, Wal-Mart and Target. As leases are signed for warehouse space that is conducive to overnight delivery by the Internet retailers, industrial vacancy will dip below the pre-recession rate. This positive momentum will lift average rents by 5 percent. This entry was written by marcusmillichap, posted on March 14, 2014 at 10:48 pm, filed under Research and tagged Commercial Real Estate, Retail Sales. Bookmark the permalink. Follow any comments here with the RSS feed for this post. Post a comment or leave a trackback: Trackback URL. Some really interesting updates coming from the market, but I am glad to see that consumer confidence has been coming up. February seemed like another positive month for the housing market in the Orlando Metro area and I would expect commercial real estate numbers to reflect that.